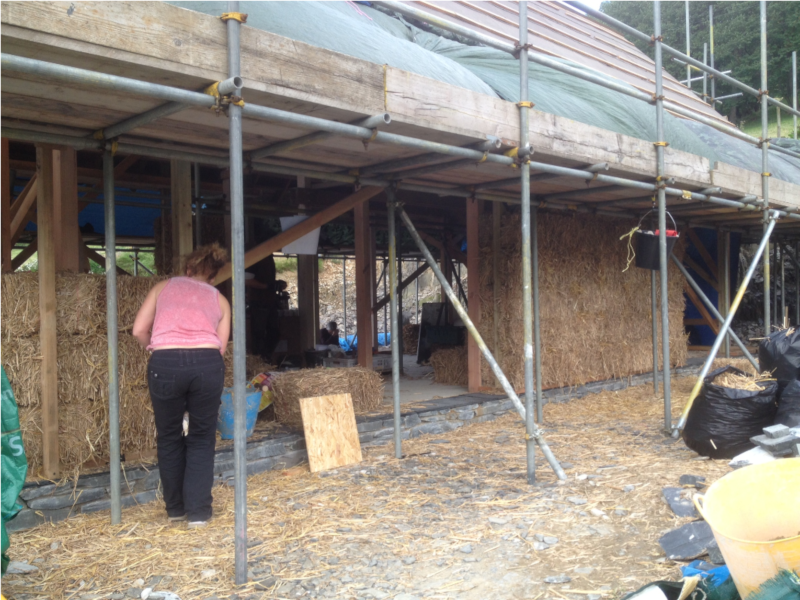 “Straw bale building in the UK has a history of artful and inspired design and has resulted in a small number of iconic buildings, and a much larger number of elegant and understated ones. However, whilst the built form and structural details vary, relatively little attention has been paid to what type of straw is used; the conventional choice in the UK is wheat and sometimes barley. Practitioners tend not to say that one straw type is better than another. 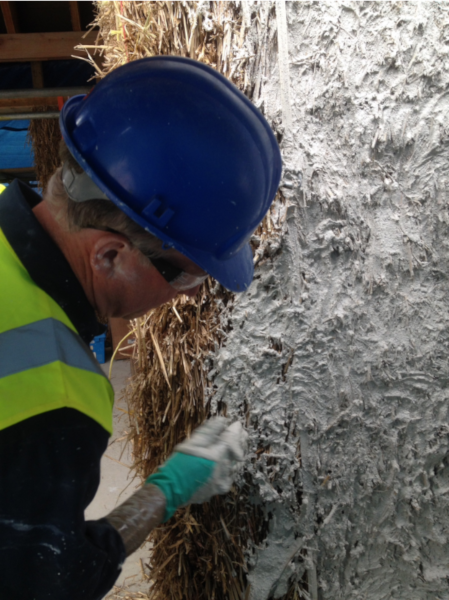 It is also quite striking that discussions on choice of bale are almost always about buildability, density and moisture content, as opposed to the plant species it comes from or the implications for long term performance of the building. So how well did it work? In most ways, using Miscanthus instead of wheat or barley was completely unremarkable. The bales weighed in at a fairly typical 18.3kg and had a low moisture content (10.7%).  They were easy to straighten, cut down to size and dress, and notches were easily cut with an alligator saw. The general construction of the walls proceeded normally, and compression was undertaken without anything unusual happening. 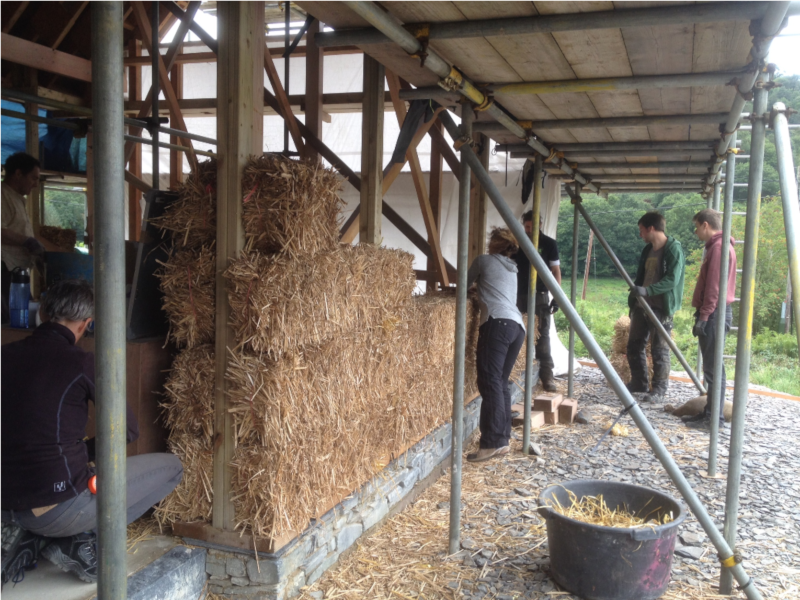 There were a couple of key differences compared to most straw bale builds, arising from the intrinsic properties of Miscanthus itself. The first is that it was too rigid to use to stuff gaps or make ‘rats’ for plastering; it has a stiff stem, that makes an audible snapping sound when you try and bend it, unlike wheat or barley which is easy to manipulate. This stiffness also meant that the bales were less pleasant to handle; definitely a case of long sleeves and trousers rather than shorts and T shirts. The third difference also related to stem durability; wall strimming prior to plastering needs a sharp blade operating at high speed (on this project a chainsaw worked well, with the alligator saw proving inadequate). The durability of Miscanthus is not surprising when we think about the biology; the plant has evolved to grow to a height of around 3 metres so needs to be stronger than a wheat or barley stem. The physical arrangement of cells in Miscanthus stems reflects this, and the chemical composition is also different, with Miscanthus having a higher lignin content than wheat straw.